Willow artist and basket maker of traditional and contemporary baskets and willow sculpture. Felt maker using traditional wet felting techniques to create scarves, wraps, bags, vessels and pictures. Commissions welcome. 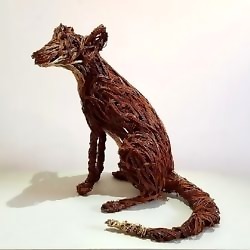 Experienced teacher delivering fun and creative workshops in basket making, willow sculpture and felt making, both for groups and individuals at my studio and other locations. Bespoke willow sculptures. Hand felted wearable items.